Creature Teacher is owned and operated by Melissa Starling, who holds a B.Sc. (Hons) in zoology and a PhD on dog behaviour, personality, emotions and cognition. She has long had a passion for animal behaviour and animal training that has only intensified the more she learns. She has experience training flighty prey animals as well as bold, opportunistic dogs. 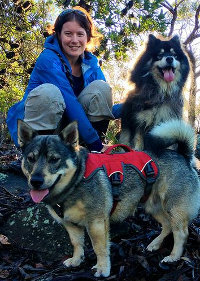 She currently shares her life with two hunds, a Finnish Lapphund and a Swedish Vallhund, as well as a small aviary of Ringneck doves with apocalyptic names. She clicker trains all of them, because it is so much fun and every animal is different. Melissa has a solid grasp of the scientific basis of learning theory and the effects of arousal and emotional state on behaviour. She wrote a paper about it, which is available free online from Animals Journal (direct link). She also has experience with a number of techniques to help dogs and other animals learn to relax and be attentive to their owners. Melissa is also very compassionate. She understands that sometimes our animal companions behave in ways that are upsetting and make us feel responsible, frustrated, or unhappy even as we simultaneously feel helpless to change their behaviour. Melissa likes human psychology almost as much as animal psychology and will not judge. Instead she will tailor for you a program that plays to your strengths and will address your animal’s unwanted behaviour.